A couple of weeks ago, I was building a DIY Steno Keyboard. I was quite happy with how the hardware worked out, but I was having some problems with writing the code and confirming that all the buttons were being recognised. I decided to try something a little less ambitious first, I will go back to the steno keyboard later. I used to use a Microwriter AgendA PDA when I was a teenager, and still remember the majority of the chords required to write all the letters and some punctuation. This means if I can build my own chording keyboard, I can use the same chords and not have to learn new ones. 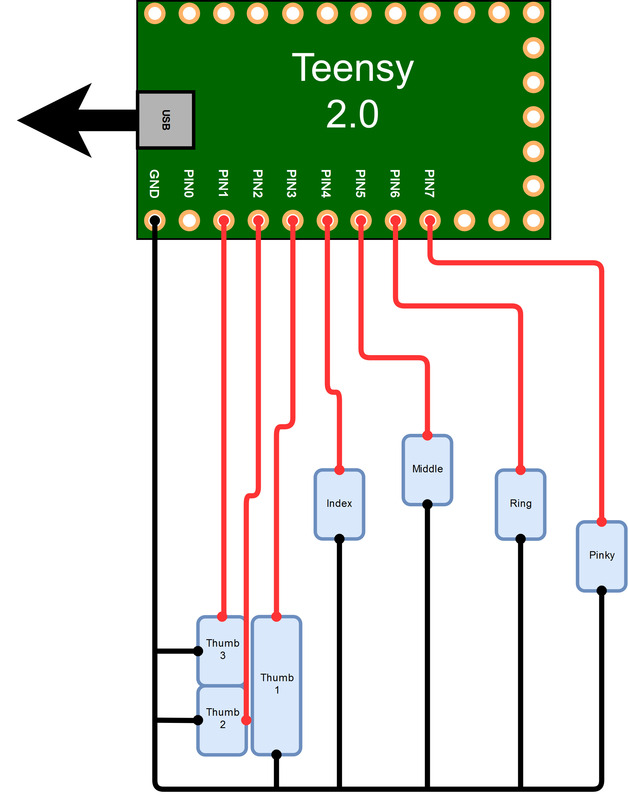 Since the AgendA only has 7 buttons, and the Teensy 2.0 board has more than 7 input pins, I can connect each button to a dedicated input pin and not bother with the matrix layout which I was using on the previous keyboard, this means that the only components required are a Teensy 2.0 board, 7 mechanical keyboard switches, and a USB cable. No need for diodes this time! I decided that, rather than building the hardware first, I'd get the code working. I think I've got the majority of the code written now, although I'd like to tidy it up. I've yet to connect any switches to the Teensy 2.0, but I am able to type letters using a wire that I've soldered to the 'GND' pin by touching it to the other pins which will eventually have switches attached. Update 20/04/2019: See Part 2 for further progress! The code uses the Bounce 2 library so that each keypress only registers as a single press. Pressing a key connects a pin to GND so it becomes low. While no buttons are pressed, the pins are all high. The code loops, checking whether any pins are low. If it finds one, it adds a '1' to the appropriate position in the 'chord' array. It keeps checking until all the buttons go high again. i.e the typist has pressed the chord and has lifted off again. At that point, it converts the array of 0's and 1's to a decimal number which is stored in the 'out' variable. The code then looks up the corresponding ASCII code and stores it in the 'key' variable. I still have a lot of characters to add to the table - they're in as place-holder comments at the moment. The code then sends the ASCII code for the key to the attached computer using the keyboard.write function. 'key' and 'out' are both set back to 0 ready for the next chord. I have a conditional statement which captures a press of the 2nd Thumb Button to toggle the 'shift' variable between 0 and 1. No character is sent when the shift button is pressed. The next character to be sent has its ASCII code reduced by 32 - this capitalises the lowercase letter. The shift variable is set to 0 after the character is sent. I intend changing this to better handle shift, ctrl, alt, and Windows modifiers. Once I have some switches mounted, I will be better able to test these. int shift = 0; // have we pressed the shift key to capitalise the next letter? // Update the Bounce instances - should do this with a for loop. // Get the values - should do this with a for loop (maybe the same loop as above? case 32: shift = shift ^ 1; break;   //Toggle the shift variable. Probably better to send the shift key (129) using keyboard.press and do a keyboard.release or releaseall after sending the next key. // Numbers - check how Microwriter did it, I've forgotten! // REPEAT LAST KEY - a nice simple key combination to repeat the previous character? out = 0; // reset the output after writing it. // add all pressed buttons to the array - this could probably be another loop. Other things I'll consider adding to the code are some shortcuts for common words and/or endings: the, that, have, with, because, -ness, -ment, -ing, -able, -less etc. I'd also like to explore having the Teensy read a config file from an SD card - that would make it easy to change the chords without reprogramming. It might be good to have multiple profiles with different shortcuts - one profile for programming, one for technical writing etc. Maybe a command chord could be used to switch profiles. It might also be good to upgrade the Teensy to one of the later versions which have much more RAM.